Due to the refining process this cocoa butter is deodorized and has little to no odor. Shelf Life: 1-2 years if stored in a dark, room temperature environment. Cocoa butter has been called the ultimate moisturizer, and has been used to keep skin soft and supple for centuries. It is one of the most stable, highly concentrated natural fats known, and melts at body temperature so that it is readily absorbed into the skin. 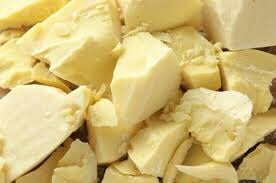 Cocoa butter is often recommended for treatment of skin conditions such as eczema and dermatitis. When applied topically, it creates a barrier between sensitive skin and the environment and also helps retain moisture. In addition, cocoa butter contains cocoa mass polyphenol (CMP), a substance that inhibits the production of the immuno globulin IgE. IgE is known to aggravate symptoms of both dermatitis and asthma. Came tightly sealed and beautifully labeled, and not a bit melted thankfully to cooperative weather :) Quickly shipped too, I appreciated the heads up that there may have been a minor delay. Though a little delayed, got here quickly once shipped. Thanks for the melt-smells like a coffee house. Yummy!